This isn’t a straight-forward review. If it was any other phone, I’d set it up, connect my usual accounts and go about my business of using it as much as possible, as with any review. However, and while this isn’t going to be a long moan about a lack of apps, I can’t do that with the Passport. Nor do I work for an organization tied to BlackBerry’s BES services either, so there’s no chance to test out things like BlackBerry Balance or corporate email; for all intents and purposes, I’m a pretty average consumer user in this scenario. That’s probably not what would play to BlackBerry’s strengths, but with the face of the workplace changing so rapidly over the last five years, the traditional enterprise as we once knew it is arguably a relic of the past. 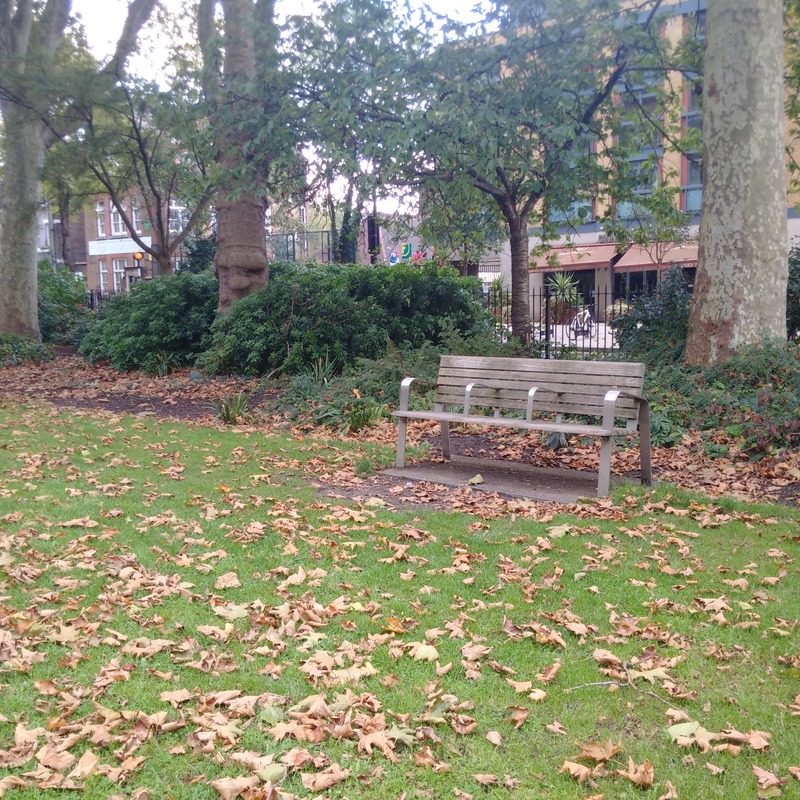 Be nimble, quick, responsive – or be dead. That’s the mantra of big business nowadays, as BlackBerry has already learned rather sharply. Outside of the corporate enterprise space, there’s a growing number of people that still want to get “work” done on their smartphone. 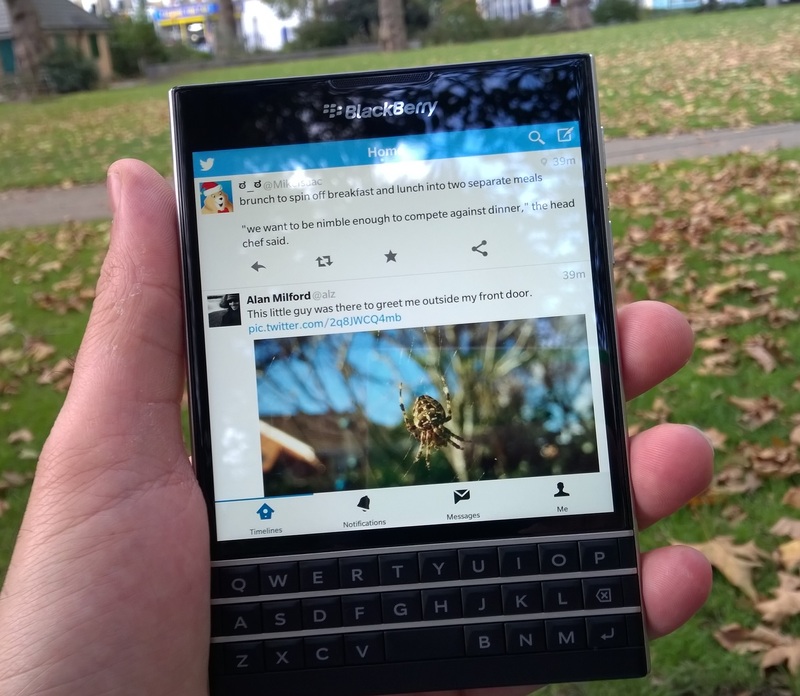 Is the BlackBerry Passport an all-round productivity powerhouse? Or is it solely the reserve of the globe-trotting executive still? What I’d have liked to be saying here is that I used the Passport as my every day phone in place of my regular Android. I’d like to be saying that, but it wouldn’t be true. The immediate deal-breaker for me was the lack of my go-to password app in either BlackBerry World or Amazon’s App Store. Without that, I’d struggle to log in to quite a few different places. Ignoring that for one second, I also use two-factor authentication pretty much anywhere it’s offered. However, the Google Authenticator app isn’t available for BlackBerry devices either (incidentally, also required to log into the password manager). BlackBerry’s lack of apps – or more specifically, developers’ lack of urgency to make apps available for BlackBerry devices – is one of the Canadian company’s biggest and most-discussed problems, and while I don’t intend to dedicate any more time to it here, it’s worth keeping in mind or checking ahead if you’re thinking about making a move across to BlackBerry. To its credit, now that Amazon’s Android App Store is supported (it’s the full Amazon App Store too, not a ‘curated’ BlackBerry version of it), there are far more apps than before, just not the ones I need, and perhaps not the ones you want either. 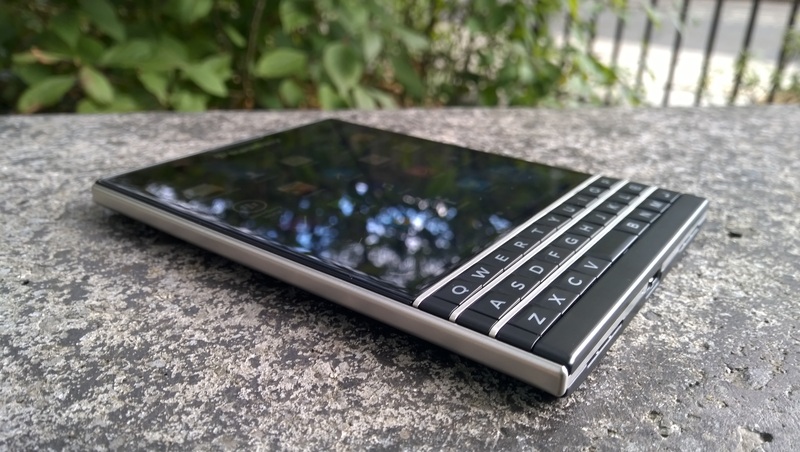 The BlackBerry Passport, as its pedigree would suggest, is a productivity beast. I’m a big fan of the BlackBerry Hub for unified notifications – it’s really handy to have everything displayed all in one place and be easily filterable – and you can choose to show only notifications from specific accounts. With the volume of emails, mentions and other assorted communications I get each day, the hub view showing all communication is a little too overwhelming, but the Priority Hub will do a good job on cutting that down to the essentials, provided you spend a little time training it on what to look out for. You can easily mark a contact or individual message as a priority and the system will learn over time. 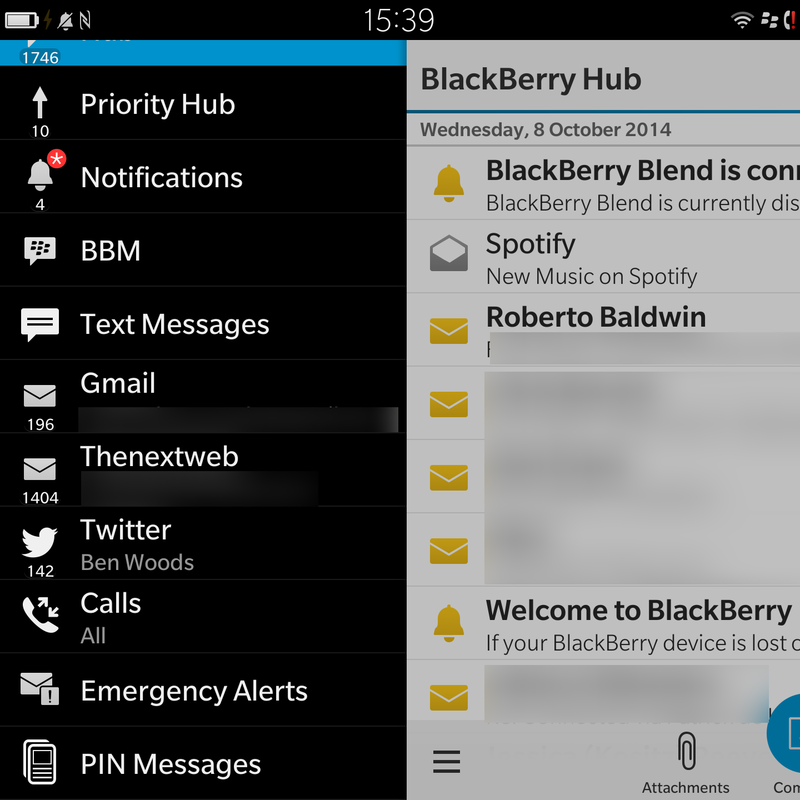 The BlackBerry Hub is well integrated into a number of apps too. Want to reply to a tweet directly from your inbox? No problem. There are also options for linking up your Evernote, Dropbox, LinkedIn and various other accounts and services. Similarly, BlackBerry’s native Remember app will automatically show you calendar-linked tasks, as well as notes made using Evernote or the Passport itself. BlackBerry 10 has some serious enterprise credentials, so there’s all sorts of document and email options, and support for offering clearly divided work and personal spaces on your phone. But as I said, that’s not me, nor likely the average consumer. It does support the email I need – primarily Google – and other tools on a basic level, but it comes without the luxury of other apps I’ve come to rely on, like Google Keep. 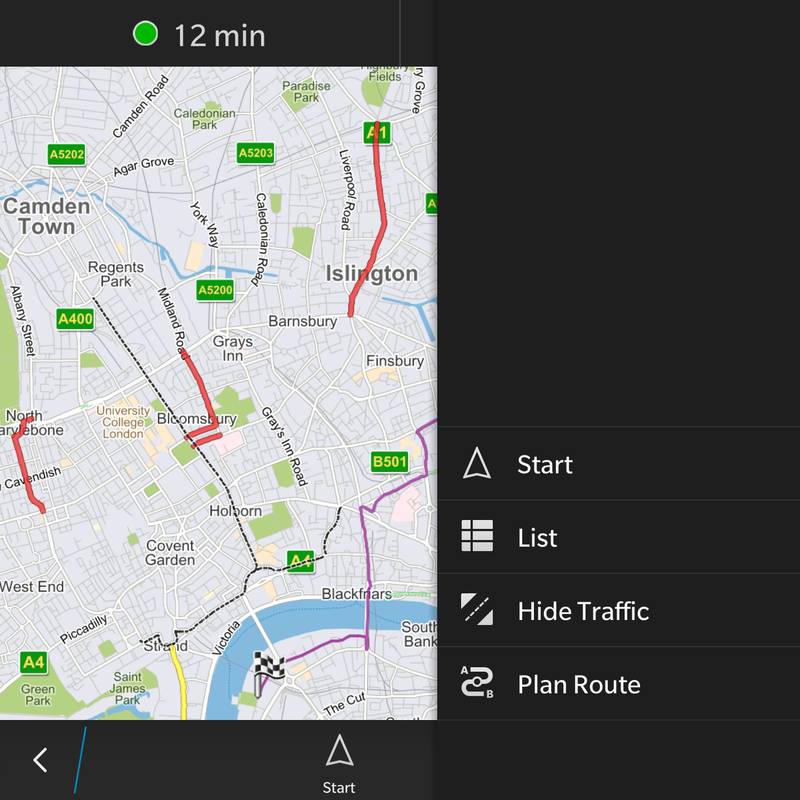 There’s also no Google Maps, but I could learn to live with that – BlackBerry’s offering isn’t terrible. In fact, it’s better than I’d feared – there’s full turn-by-turn voice-guided navigation, routing options (including traffic-based) and the Passport’s 4.5-inch 1440 x 1440 pixel display does a good job of showing you more of the map than a regular 4.5-inch handset. It seems a square display is particularly well suited for map use. As you might expect with a work-focused device, there’s an on-board document editor, but as someone who works in the cloud, I didn’t find it a lot of use out of the box – connect up your Dropbox account though and you’ll be all set, unless your files are in Google Drive, like mine. If you’re an Evernote user, you’ll also be fine too; there’s a powerful on-board editor and other integrations into the OS. Overall, the Passport offers a pretty complete productivity package – provided you’re in touch with the old-school enterprise – if you’re using a new wave of work tools, you might struggle to stay in touch with your team. For example, with Convo and Slack both in use at TNW, it’s essential for me to have the native mobile apps installed. Unfortunately, neither of them are available. This is a situation that is repeated more than once. If you need specific, reasonably new SME-focused, mobile-first services, most of those aren’t launching on BlackBerry first. The idea behind the display is that by using a 4.5-inch 1,440 x 1,440 pixel panel, it should give you more screen real-estate. With 453 PPI (pixels per inch) it’s certainly crisp enough, but this isn’t really a device aimed at video or other media consumption. Not that it can’t handle it, the square display just doesn’t lend itself to watching movies – content tends to be optimized for 16:9 displays nowadays. Rather, that extra space is designed to show you extra lines of text (60 characters per line, instead of 40) in emails, the browser and a few other situations. However, while it works fine for browsing, the way in which BlackBerry handles and displays email means that you can actually see less of a message than if you were looking at it through the native Gmail app for Android, for example. The screenshots below show the messages displayed on the Passport and the LG G3, which admittedly has a 5.5-inch display. Even so, there are actually fewer characters being shown per line. The Passport’s square display actually show less characters per line in some situations, as you can see here. 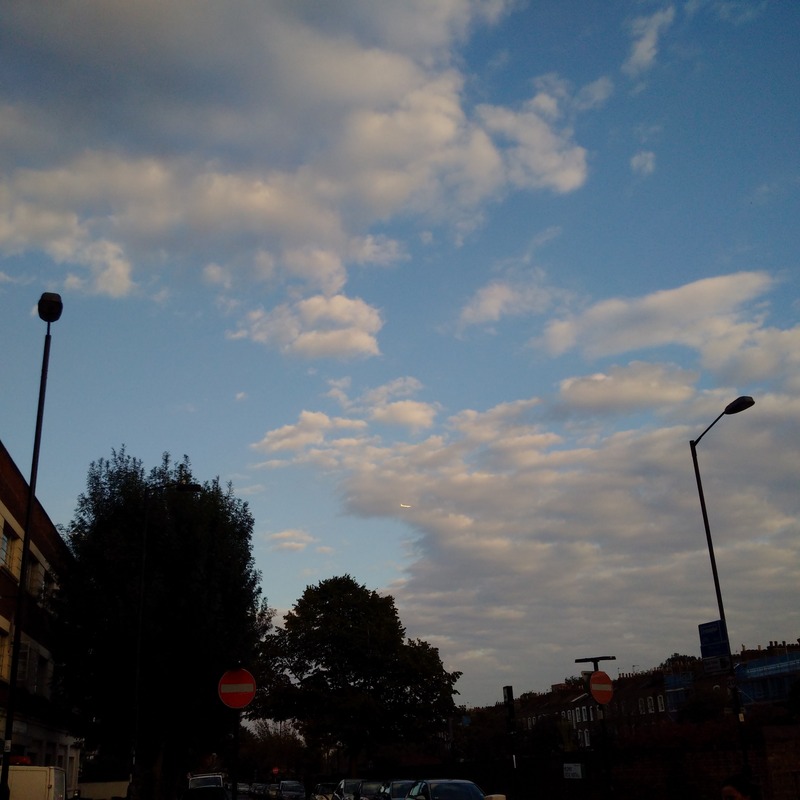 Cropped Android screenshot on the right. Whether or not the payoff is worth it to you is a personal feeling, but I’d have to lean towards ‘not’ for me. That’s not to say the square screen has no other function – it certainly serves to set the Passport out from the pack. Throw down a selection of modern smartphones and a lot of them might look similar, but none of them look like the Passport. The rest of the time, the display performs admirably, swiping never leaves you wondering if your touches have been registered, it’s visible in direct sunlight (although not the brightest on the market) and the 2.2GHz processor leaves general navigation feeling effortless. It’s just a bit of a shame that it doesn’t quite deliver on its promised purpose. The other stand out factor on the Passport is the keyboard. BlackBerry is known for its keyboards, so it’s not surprising to see it trying to curry favor with its core audience, but it is surprising that the Passport eschews its usual design to go with a hybrid hardware-software combo. Instead of where the top row of keys would usually be, they’re now found as virtual buttons. It’s a set-up that takes some getting used to – particularly if you aren’t used to hardware keyboards at all anymore – but even once you’ve acclimatized, it wasn’t one that ever felt natural for me. The look of the backlit keys is nice though, and handy if you find yourself tapping away in a darkened room. The word prediction system is pretty interesting too, just swipe up on the keyboard underneath the word you want to insert and it’ll fill it in. The suggestions are pretty smart too. This gesture capability on the keyboard can also be used in other areas too, like when using the browser, where a quick swipe up or down on the keyboard will scroll the screen for you, therefore ensuring that your hands aren’t blocking the content. Personally, I found the overall feeling of the keyboard to be a bit cramped (even though the textured keys made them comfortable to use) and never quite got completely on board with the word prediction and gesture system. 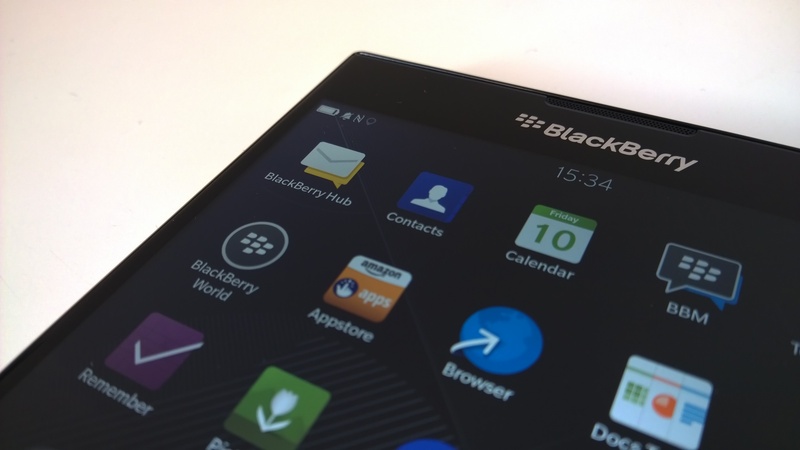 For the Passport, BlackBerry introduced a new syncing system called Blend. 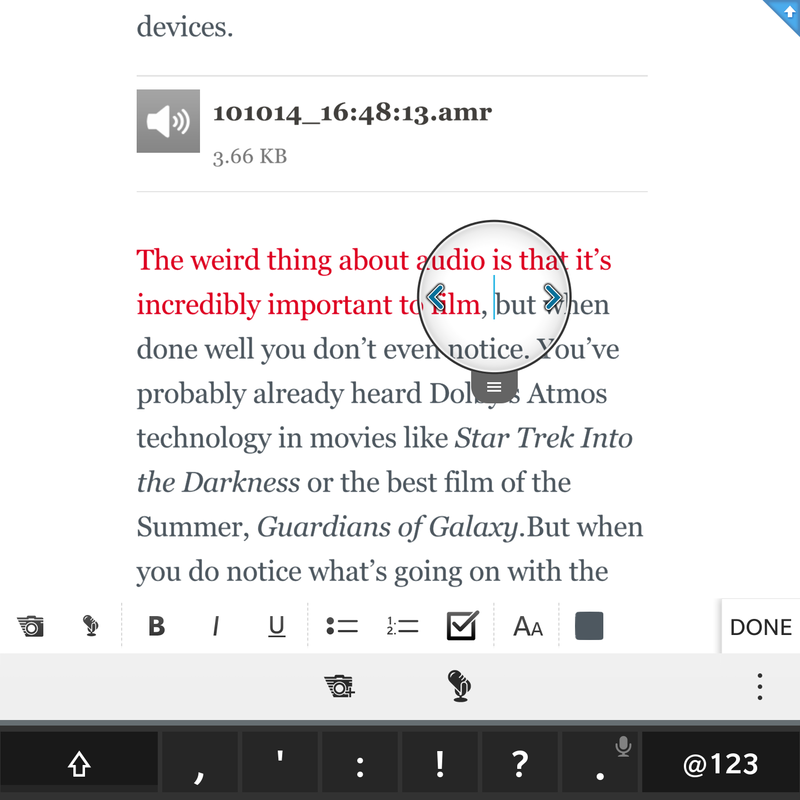 As you might expect, Blend makes the content on your phone available across the rest of your devices. 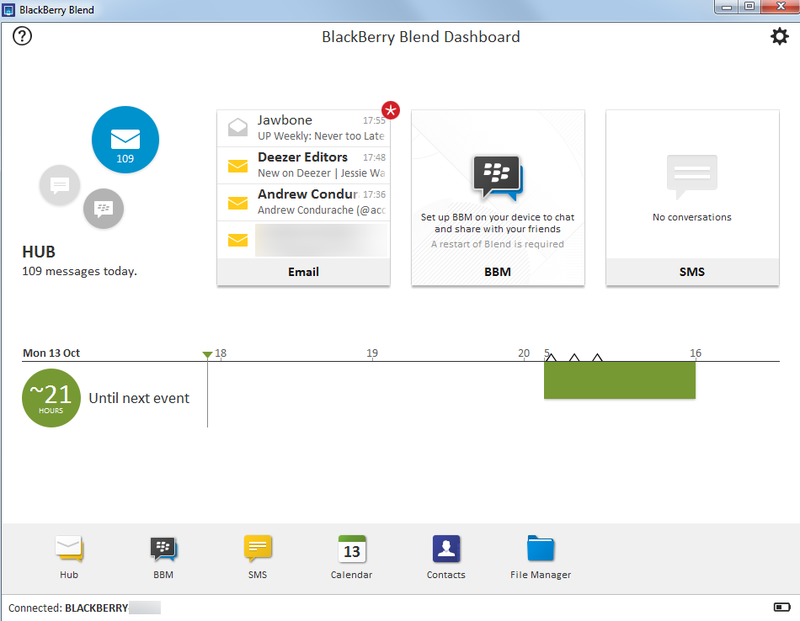 As well as simply providing you with access to content though, Blend allows you to respond to messages or emails shown in your BlackBerry Hub directly from your desktop or tablet. There’s also now a business-focused assistant on board, which allows you to input commands with text or voice, like Google Now, rather than just voice, as Siri offers. It’s slower to return results than either of those other two though. That aside, BlackBerry’s Assistant does offer a few features you won’t find elsewhere, like the option to search for contacts (to call or send a message, for example) stored on the corporate side of your device, if that applies to you. In contrast, if you use an iPhone in a managed work environment, Siri doesn’t get access to data stored on the work side. 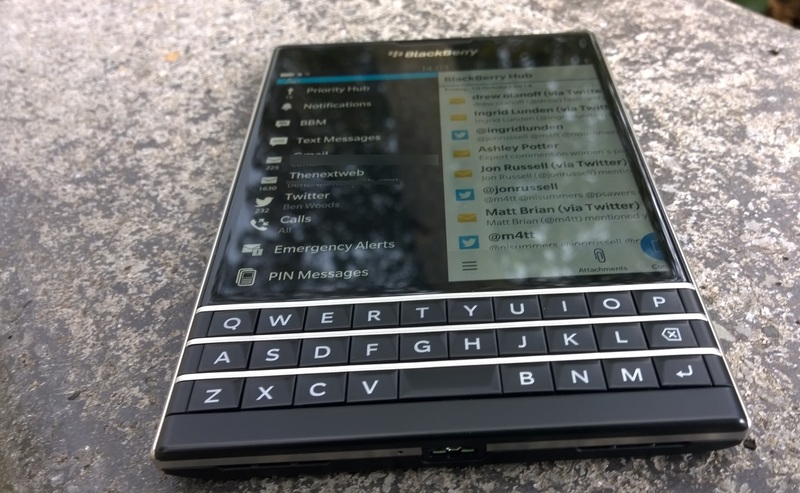 Thanks to BlackBerry Assistant’s integration across the system and into the Hub, the Passport has no problems there. The battery life on the Passport is pretty impressive too, although I can’t be sure that isn’t down to using it less than I would my daily phone. As I said at the start, the phone lacks a few essentials that would have allowed me to do this, so it follows that I probably watched or listened to less content as a result. Even factoring that in though, the Passport is easily going to get you through the day. 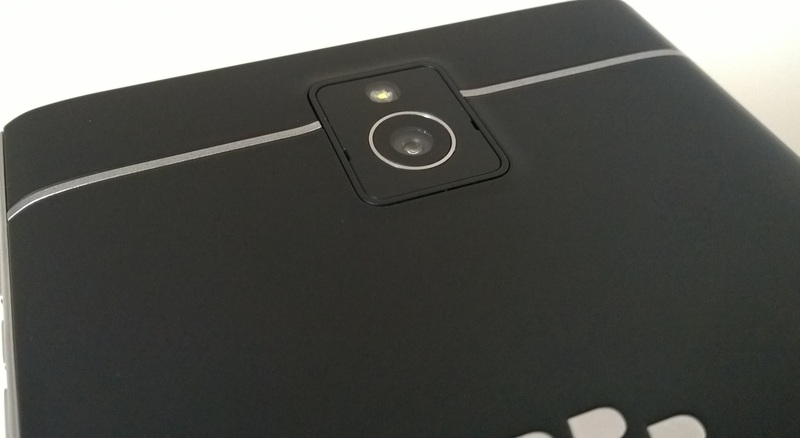 In a section called ‘best of the rest’, the camera doesn’t quite fit, as it isn’t one of the device’s standout features. It works and the 13-megapixel snapper will provide you with perfectly functional images, but you’ll probably give up using it soon enough if you’re a real photography fan. Naturally, given its business angling, there aren’t as many options for playing around with images pre or post-capture as you’ll find on a regular range-topper. In some situations, I was left far too long waiting for the shutter to actually take the shot as the auto-focus adjusted itself. Also, if you don’t want square photos, you’ll need to remember to change the aspect ratio in the settings menu, which is simple enough. In many ways, the Passport is a great smartphone, but its features, design choices and out-of-the-box services mean it’ll only ever really appeal to a small section of the market. Unsurprisingly as it was stated right at the start, I can’t replace my Android smartphone with a BlackBerry, but for people who still carry separate work devices, this is likely not a problem. And primarily, for me, it’s only the lack of specific apps that would really stop me using it as a primary device. The less than stellar camera comes a close second though. The company has worked hard to ensure that certain areas of the Passport improve your efficiency, thereby cutting down on the amount of time you spend attending to notifications and messages and the end result against this measure is impressive – even if the three row keyboard is a bit odd. While it’s likely to be a divisive hardware design, I actually quite like it – just not for its stated purpose of giving you more lines of text. Scrolling has never been the biggest challenge, really. I also like the soft-feel rubber back on the device, both for how it feels in the hand and also because the rubber gives you some extra grip, which is handy on a square phone. That said, I hate the feeling of removing the top of the phone’s rear panel to gain access to the SIM card slot. I really did wonder if it would break the first time I opened it. Ultimately, the no frills approach of BlackBerry 10 might be something you’re yearning for – and if you’re not already familiar, it likely wouldn’t take you too long to get up to speed – it keeps certain similarity with rivals’ platforms, like a pull down notifications bar. But you’ll need to want to get up to speed in the first place. It’s this problem that BlackBerry is still grappling with for me. More than perhaps expected, I enjoyed using the Passport – but for every place that it excels, it asks you to make a compromise somewhere else. And the more that happens, or the more frequently you find a service you can’t use, the less real-world value all the focus on productivity actually delivers. As a professional working remotely a lot of the time, the Passport couldn’t offer everything I needed in a single smartphone, but part of me wishes it could. Then again, it’s not really aimed at me now, is it.